Sciatica is the pressure or impingement of the sciatic nerve. The sciatic is a large nerve that runs from the lower spine down through pelvis and down into the legs. Sciatica often presents as numbness, pain and discomfort radiating from the lower back through the hips, buttocks or legs. It’s not uncommon for leg pain or pain into the buttocks to be mistaken for true sciatica. In our experience, sciatica can be resolved through conservative, non-invasive treatment in just a few weeks and shouldn’t require surgery if addressed early. 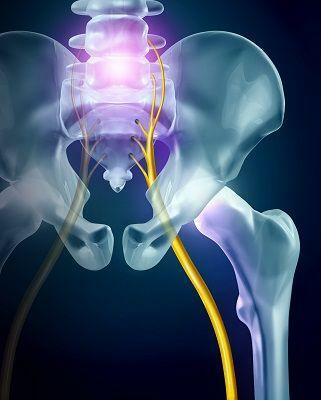 Sciatica that doesn’t resolve may cause weakness in the legs or even loss of bladder and bowel control. In cases such as those, surgery may be appropriate. But because most sciatica is caught early, we can get you set straight long before anything like that happens. Dr. Ibolit Chiropractic, Physical Therapy & Massage has the tools and knowledge necessary to fully treat most cases of sciatica. Sciatica is most often described as a radiating pain from the lumbar spine that runs from the lower back down to the upper leg or even the calf muscle. Mild sciatica is typically associated with discomfort or tingling along the pathway of the sciatic nerve. Radiating pain, tingling or numbness from the lower back to through the leg. Our chiropractic team will assess your lower spine to determine the extent of any pressure or impingement on the sciatic nerve. This will also reveal any muscle imbalances or possible inflammation that may be causing your sciatica. Massage may help relieve sciatica caused by muscle tightness or muscle imbalance. It may also provide immediate muscular relief that enables patients to perform movements or stretches that could help with the condition. Physical therapists will be able to recommend the best course of action for sciatica treatment. Regimens may include rest, icing, stretching and any number or targeted exercises to strengthen appropriate muscles without disturbing the nerve. Sciatica is most often a symptom of an underlying condition. It may signify a bulging or slight herniation to a disk, faulty movement patterns, muscle imbalance or any number of issues. Our office can help identify the root cause of your sciatica and determine the proper course of action for treatment. When sciatica is caught early, it can almost always be completely treated within a few weeks. Patients might be able to see improvement within a single session depending on severity. Our staff can resolve your pain and set you on course to prevent it from happening again. 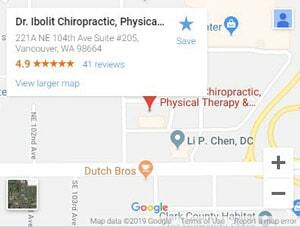 Dr. Ibolit Chiropractic, Physical Therapy & Massage has successfully treated dozens of cases of sciatica – from mild to severe. Whether your sciatica was caused by prolonged inactivity or was acquired following injury, our team knows exactly how to relieve your symptoms.